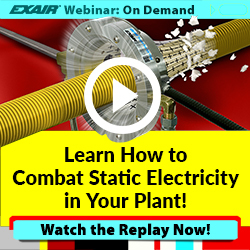 “Go Green” in 2019 With EXAIR’s Super Air Nozzles & Jets! If one of your New Year’s resolutions for 2019 is to help improve your impact on the environment, look no further than EXAIR’s Engineered Air Nozzles & Jets. By upgrading your blowoff, cooling, and drying operations to use one of our Super Air Nozzles or Jets you can save as much as 80% of your compressed air usage when compared with an inefficient solution. An open copper pipe or tube, even if “flattened” as we’ll commonly see, wastes an excessive amount of compressed air. This wasted compressed air can create problems in the facility due to unnecessarily high energy costs and the pressure drop that can be experienced affecting other processes. In addition to simply using too much compressed air, an open pipe or tube will often produce sound levels in excess of 100 dBA. At these sound levels, according to OSHA, permanent hearing damage will occur in just 2 hours of exposure. By simply replacing the open tubes and pipe with an EXAIR Super Air Nozzle, you can quickly reduce air consumption AND reduce the sound level. Sound level isn’t the only thing an OSHA inspector is going to be concerned about regarding an open pipe blowoff, in addition OSHA 1910.242(b) states that a compressed air nozzle used for blowoff or cleaning purposes cannot be dead-ended when using with pressures in excess of 30 psig. I don’t know if you’ve ever tried to use an air gun with 30 psig fed to it, but the effectiveness of it is dramatically reduced. This is why there needs to be a device installed that’ll prevent it from being dead-ended so that you can operate at a higher pressure. EXAIR’s Super Air Nozzles are designed with fins that serve two purposes. They help to entrain ambient air from the environment, allowing us to maximize the force and flow from the nozzle but keeping the compressed air consumption minimal. In addition, these fins are what prevents the nozzle openings from being completely blocked off. Using an OSHA compliant compressed air nozzle for all points where a blowoff operation is being performed should be a priority. Each individual infraction will result in a fine if you’re subject to an OSHA inspection. Inspections are typically unannounced, so it’s important to take a look around your shop and make sure you’re using approved products. So, go ahead and make 2019 the year of energy savings, increased efficiency, and improving worker safety. You’ll find all of the tools you need in EXAIR’s 32nd edition of the catalog. Click here if you’d like a hard copy sent directly to you! Or, get in touch with us today to find out how you can get saving with an Intelligent Compressed Air Product. Last week, I received an email from a satisfied customer, after he had already purchased our product. Come to find out this customer had not spoken to an application engineer during the planning stage to make their purchase. 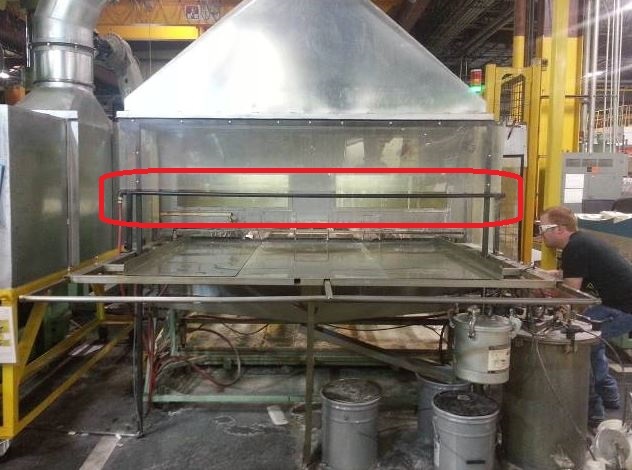 With our excellent resources listed at EXAIR.com, the customer was able to fulfill his application without even speaking to us. After his initial email of thanks, he also shared with me some details of his application that I want to share with you today. The customer works as a machinist at a large aircraft part manufacturer. The parts require a very tight tolerance. A sample of each part needed to be gauged and measured in an automatic thread gauging machine or a coordinate-measuring machine (CMM). Their machining process required a water based flood coolant, so each part would be coated in water based coolant and chips, which needed to be remove before gauging. 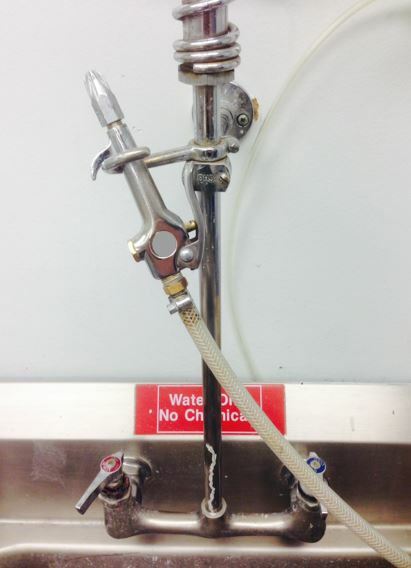 Before visiting EXAIR’s site, the company used a variety of homemade and commercial blow offs, as safety air gun tips. Here is a photo of (20) of the (25) nozzles the customer was using. As you can see, the nozzles vary in design purpose, flow and safety. 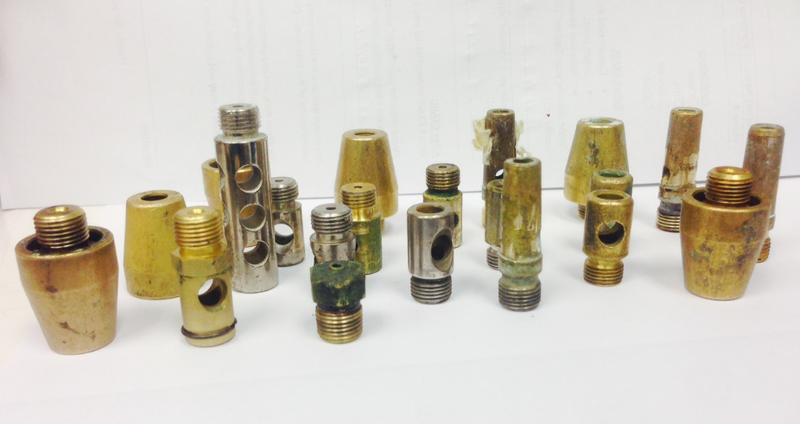 Most of the nozzles feature a cross drilled hole or a secondary escape path, but not all of the nozzles do. Any nozzle without a secondary relief port violates OSHA standard CFR 1910.242(b), so replacing some of the nozzles increased the safety in the plant. Secondly, these nozzles are wasteful in their use of compressed air because some were designed as liquid nozzles and have large exit holes. A hole that is 1/8″ in diameter at the nozzle outlet can consume up to 21.4 SCFM of compressed air at 80 PSIG. For comparison, the model 1103 Mini Super Air Nozzle with a 1/8″ NPT inlet will flow 10 SCFM at 80 PSIG, which would be a 53% compressed air savings. In 24 running hours, the 1103 nozzle will save 16,416 Standard Cubic Feet, which the plant spent $4.10 for a standard industrial compressor to produce (The standard for compressed air cost is $0.25 per 1,000 SCF). Replacing just one 1/8″ drilled hole with 1103 Mini Super Air Nozzle saves the aircraft company $1,026 over 250 working days running 24 hours a day. Neither of these were the real reason that the customer emailed to thank us though. He was actually an office employee just entering the work force. Starting in June until after the company finally acquiesced to his request to buy a better, quieter nozzle near the end of July, he had left work needing an aspirin to relieve the headache he acquired due to the noise from these other nozzles. The nozzles the machining center had been using would create noise levels between 88-100 dBA at 80 PSIG of inlet pressure. For reference OSHA mandates that employees are required to wear hearing protection, if they are exposed to noise levels over 90 dBA over an 8 hour work day. The employees doing the machining wear hearing protection, but the employees in the office were still exposed and affected by the noise level. This is just one anecdotal example, but everyday more and more research shows that noise exposure has a negative effect on our health and productivity in the workplace. If you are interested in more information here are some links to a number of studies/research – please read this, here or this. Anyway, that’s enough of my soapbox. The company purchased 25 of EXAIR’s 1103 Mini Super Air Nozzles and utilizing the same guns they were currently using saw between a 10-15 dBA decrease in noise levels near the work stations. Here is a photo of one of their setups with the model 1103 installed on one of their current air guns. The 1103 Super Air Nozzle is an engineered solution to replace a plethora of commercial nozzles. It was a simple and cost effective retrofit which increased the comfort of employees. We know that every time they squeeze that air gun trigger they will be using less compressed air than before, and we know they are now in compliance with OSHA. But the best benefit for EXAIR is we know that the engineer took the time to email us to thank us for taking away his headache everyday. That’s enough for me. We can answer, almost unequivocally, with a resounding “YES!” Whether we can meet the needs of the application with a stock product, or through manufacturing a specially made unit, we make every effort to provide the needed solution. Case in point, in the application above, a specific length Air Knife was desired to remove debris from material as it goes into a processing chamber. The current setup (outlined in red) uses drilled holes in a section of pipe which are costly, loud, and unsafe. How loud, you ask? Our customer confirmed all personnel near the application were require to wear ear protection at all times. Though they were unable to provide a decibel (dBA) level, the need for hearing protection would indicate this pipe was operating in excess of 100 dBA. How unsafe, you ask? Air can be dangerous when the outlet pressure of a hole is greater than 30 PSIG. In the event any of the holes were blocked by a hand or other body part, air may enter the bloodstream through the skin, resulting in serious injury. All of the Air Knives manufactured by EXAIR have been engineered for safety. 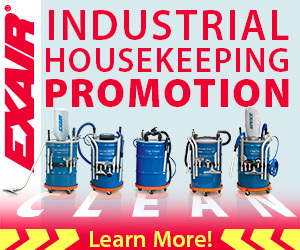 They are all safe to be supplied with higher pressure compressed air and meet OSHA standard CFR 1910.242(b). Drilled holes in a pipe DO NOT MEET this OSHA standard. Initially, discussions with this end user focused on a custom length, custom built Super Air Knife. Given the dimensions of the processing environment, we determined the desired length and the end user was thrilled we could not only make to their specifications, but offer 3 day delivery as well. As the discussion carried on, we realized that the special length Super Air Knife, while applicable, was not a critical requirement for the application. With this new consideration, a stock length knife was chosen, and just like any stock EXAIR product, we had it on the shelf, ready to ship the same day. This application highlights several benefits of the EXAIR Super Air Knife solution – compressed air savings, noise reduction, providing safety, and quick delivery. EXAIR Super Air Knives solve multiple problems for end users and OEM’s in a variety of applications. $2812.50 (drilled pipe annual air cost) – $1044 (EXAIR 96″ Super Air Knife air cost) = $1768.50 SAVINGS the first year! Noise levels reduced to under 80 dBA. SAFETY: EXAIR Super Air Knives meet the OSHA standard CFR 1910.242(b). Switching this customer over to an engineered solution provided a win in these three important areas of any operation. If assistance is needed determining which Super Air Knife best suits your application, contact an Application Engineer.